The larger and more powerful ECO9 is perfect for baking off chilled or frozen convenience bakery products. The excellent twin fan air circulation system delivers a highly efficient air circulation ensuring consistent and even cooking and faster cooking times. Water injection facility gives a professional finish to breads and pastries. The useful cook and hold facility reduces oven temperature to 80 degs C at end of cooking period. Stackable for added flexibility and to make the best of use of floorspace. 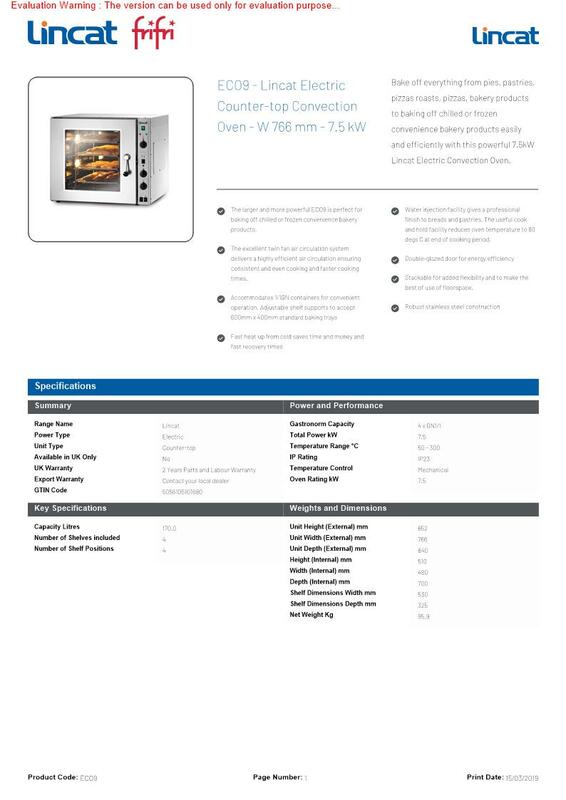 Bake off everything from pies, pastries, pizzas roasts, pizzas, bakery products to baking off chilled or frozen convenience bakery products easily and efficiently with this powerful 7.5kW Lincat Electric Convection Oven.